The Walhalla is a hall of fame that honours laudable and distinguished people in German history – "politicians, sovereigns, scientists and artists of the German tongue"; thus the celebrities honoured are drawn from Greater Germany, a wider area than today's Germany, and even as far away as Britain in the case of several Anglo-Saxons who are honoured. The hall is a neo-classical building above the Danube River, east of Regensburg in Bavaria. The Walhalla is named for the Valhalla of Norse Paganism. It was conceived in 1807 by Crown Prince Ludwig in order to support the gathering momentum for the unification of the many German states. Following his accession to the throne of Bavaria, construction took place between 1830 and 1842 under the supervision of the architect Leo von Klenze. The memorial displays some 65 plaques and 130 busts covering 2,000 years of history, beginning with Arminius, victor at the Battle of the Teutoburg Forest in AD 9. By 1806 Napoleon's First French Empire had annexed German lands along the Rhine River and the North Sea. Central German states formed the Confederation of the Rhine, which sided with Napoleon. Francis II, Holy Roman Emperor, then formally dissolved the Holy Roman Empire of the German Nation (6 August 1806) and instead styled himself Emperor of Austria. The War of the Fourth Coalition (1806-1807) pitted German forces on both sides against each other, and Napoleon again prevailed. In 1807, 20-year-old Crown Prince Ludwig of the Kingdom of Bavaria (newly elevated from Electorate to Kingdom by Napoleon in 1806), had the idea of reminding all Germans of their common heritage – of the great figures and events in ethnic German history. He commissioned several sculptors to create busts of famous individuals of his choice. 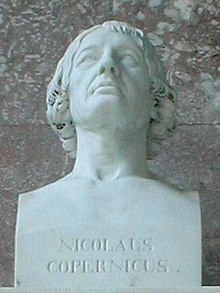 Johann Gottfried Schadow's bust of Nicolaus Copernicus became one of the first completed, in 1807. Further suggestions for individuals to be honoured were solicited in 1808 from Swiss historian Johannes von Müller. By the time of Crown Prince Ludwig's coronation as King Ludwig I of Bavaria in 1825, 60 busts had been completed. In 1826 Ludwig commissioned the construction of a memorial above the Danube River, near Regensburg, modelled after the Parthenon in Athens. The southern pediment frieze features the 1815 creation of the German Confederation; the northern, scenes from the Battle of the Teutoburg Forest of 9 AD. According to Pictorial Travels Continentally Described (circa 1892), the construction of the building cost £666,666. A two thaler coin was minted commemorating the opening of the Walhalla, Krause catalog number KM# 811. It is moderately scarce. At Walhalla's inauguration on October 18, 1842, there were 96 busts, plus 64 plaques for persons or events of which no portrait was available on which to model a sculpture. When the memorial was opened in 1842, Joseph Hartmann Stuntz authored a poem about Germany's greatness which was set to music by Joseph Hartmann Stuntz. As being "of the German tongue" (viz., Germanic tongue) was the main selection criterion for the original 160 persons representing the 1,800 years of German history, the King included individuals of the wider Germanic sphere, including ancient Germanic notables as well as people from the Holy Roman Empire. Whereas the Valhalla of Norse mythology served as home to those gloriously slain in battle, Ludwig intended his Walhalla not only for warriors but also for scientists, writers, and clerics, and specifically included both men and women. Decades before the foundation of the modern German state in 1871, "German" was understood as "Germanic", and included ancient Germanic (Gothic, Vandal, Lombardic, Anglo-Saxon) as well as medieval and modern Austrian, Dutch, Swedish and Swiss figures. The first addition to the collection was the bust of Martin Luther. Ludwig, as a devout Catholic, had hesitated to include Luther. Several of the sculptors, including Ohnmacht and Schadow, had urged the king to include Luther, as did Johannes von Müller. Heinrich Heine (who would himself be inducted into the collection in 2010) mocked the omission in his satirical poem Lobgesänge auf König Ludwig, saying: In Naturaliensammlungen fehlt / Oft unter den Fischen der Walfisch ("often, in naturalist collections of fish, the whale is missing"). 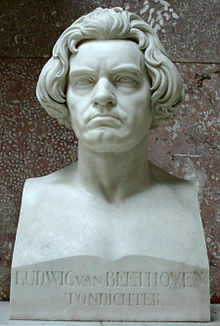 Ludwig finally commissioned Luther's bust in 1831 with Ernst Friedrich Rietschel. It was not included at the inauguration of Walhalla in 1842, but added still by Ludwig himself in 1848. Luther's bust was placed next to the last of the original busts (Goethe's), disregarding the chronological arrangement by year of death. Four further additions were made during Ludwig's lifetime: Archduke Charles, Duke of Teschen (died 1847, added 1853), Josef Wenzel Graf Radetzky von Radetz (died 1858, added in the same year), Friedrich Schelling (died 1854, added 1860) and Ludwig van Beethoven (added 1866). 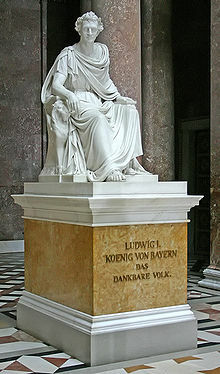 In 1853, King Ludwig I established an additional Hall of Fame in Munich, specifically for Bavarians – the Ruhmeshalle München. Nine of the Bavarian enshrinees have since become Walhalla enshrinees. Thus, their busts in the Ruhmeshalle, which were destroyed in 1944 in a bombing raid, have not been recreated. Instead, a plaque with their names tells of their transfer to Walhalla. 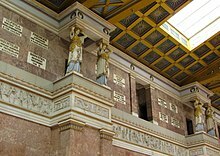 King Ludwig I himself, who commissioned the Befreiungshalle and other monuments, was also enshrined both at Walhalla and in the Ruhmeshalle. Helmuth von Moltke the Elder was the last addition of a military leader (in 1910). After World War I, new additions focussed on artists and intellectuals. Beginning in 1933, when Kraft durch Freude and other National Socialist organizations promoted trips to Walhalla, visitor numbers increased exponentially. In 1937, when Hitler unveiled a Bruckner bust, 131,520 were counted. The Walhalla memorial was reached by the Allied invasion of Germany in April 1945, by the US 3rd Army led by General George Smith Patton, Jr. Additions since 1945 are proposed by private individuals or private foundations, who will also pay for the production of the new bust. Suggestions are reviewed by the Bavarian Academy of Sciences, based on which a recommendation is made by the Bavarian Ministry of the Interior. The final decision lies with the Bavarian Council of Ministers. Official practice since 1945 has been to favour "eminent figures from science or art, or individuals with extraordinary social or caritative merit". Nineteen busts have been added between 1945 and 2018, for an average interval of a little below four years between additions: Max Reger (1948), Adalbert Stifter (1954), Joseph von Eichendorff (1957), Wilhelm Conrad Röntgen (1959), Max von Pettenkofer (1962), Jakob Fugger (1967) Jean Paul (1973), Richard Strauss (1973), Carl Maria von Weber (1978), Gregor Mendel (1983), Albert Einstein (1990), Karolina Gerhardinger (1998), Konrad Adenauer (1999), Johannes Brahms (2000), Sophie Scholl (2003), Carl Friedrich Gauss (2007), Edith Stein (2009), Heinrich Heine (2010), Käthe Kollwitz (2018). The addition of a bust of Max Planck is scheduled for 2019. 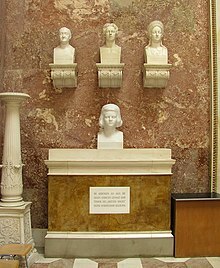 The original busts are arranged in rows by date of death At the inauguration in 1842, a total of 96 busts were arranged, in two rows, in chronological order (by year of death), beginning with Henry the Fowler (d. 936) and ending with Goethe (d. 1832). The upper row comprised 70 busts, beginning with Henry the Fowler and ending with Maria Theresa. The lower row comprised a total of 26 busts of modern scholars, beginning with Lessing and ending with Goethe. 130. Sophie Scholl (2003) – German passive resistance activist against the Nazi regime. Plaques were made for people (or acts) of which no portraits or descriptions were available to model sculptures after. The timeline spans from Arminius a.k.a. Hermann der Cherusker (born 17 BC) to watchmaker Peter Henlein, who died in 1542. In 2003 a plaque was added to commemorate the German Resistance against Nazi Germany. Plaque numbers 1–32 represent the upper row, 33–64 the lower row. Each plaque includes a short characterization of the individual, with the year of death given in Roman numerals. The year of death in the table below is that given on the plaque, even where modern historiography suggests a revised date. 01 Arminius 0021 Leader of the Cherusci, victorious at the Battle of the Teutoburg Forest in AD 9. The 65th plaque, dedicated to the Widerstand (Resistance) against Nazi Germany, added in 2003, is not part of the two rows of 64 numbered plaques. Wikimedia Commons has media related to Walhalla. ^ "Käthe Kollwitz und Max Planck kommen in die Walhalla", Welt, 19 December 2017. Simone Steger, Die Bildnisbüsten der Walhalla bei Donaustauf Von der Konzeption durch Ludwig I. von Bayern zur Ausführung (1807–1842), dissertation, Ludwig–Maximilian University, Munich (2011). Ludwig I of Bavaria, Walhalla's Genossen (1842, 2nd ed. 1847). Look up Walhalla in Wiktionary, the free dictionary.